The European dream is almost similar to the Indian reality. That is why the European Union must get focused for strengthening Indo-European ties to succeed. India and China are unique neighbours. Once both the countries’ leaderships grasp this truth, together they might succeed in shaping the global future of humanity. First of all they must not fail to trust and respect each-other’s integrity and sovereignty. This can only be done by treating Pakistan like Taiwan and Tibet like Kashmir. Their such an understanding can enhance their own prosperity along with the prospects of world peace. Sangkrit insists upon adopting Internet Years for determining the universal human calender by counting all times ptior to that as Before Internet. Nothing else has ever been that relevant to humanity in general. Therefore the humankind must adopt this everywhere. 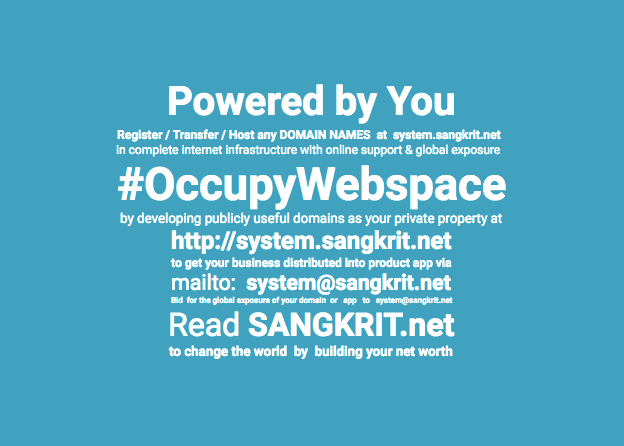 Sangkrit encourages you to think about changing any ways of doing things altogether to startup to disrupt. Higher the level of disrupt you may do may make your startup more successful. This could begin simply by registering your idea of doing things differently as your domain at system.sangkrit.net and regularly investing into that only. Whenever people fail to resolve technologically, politicians get a chance representing them. Thus through this smartphone stage of internet age, the politics remains nothing more than a technical failure. Like the failure in reasoning used to spread superstitions while science used to pave the way beyond that, the politics too gets formed in this gap and apartheid in all possible formats is continued everywhere due to that. Ultimately technology would make a total solution so that no gaps are nowhere left in any situation for the politics to continue like that with the emergence of the internet of everything.